« AFL Football Jumper in hiding ? New Zealand Hawks , have won the 2011 Youth AFL Oceania Cup Grand Final, beating Nauru by 21 points in Suva, Fiji on Saturday. The best player was a New Zealander , Shem Tatupu. AFL stars, Nic Natinui and Israel Folau have been cheering the locals on . Countries involved in the series include Tonga ,Vanuatu , Fiji , PNG , NZ and Nauru. The Aussies , the Flying Boomerangs , played an exhibition match against Oceania , winning very convincingly . Oceania and South Pacific will field teams in the 2012 NSW State Trials and NAB AFL Under-16 Championships. 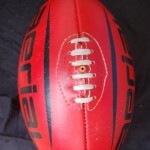 AFL Football , currently enjoying the break prior to the 2012 Competition, is making inroads into the Oceania / South Pacific region . Will we see Islanders of the calibre of Natinui , joining the AFL competition ?. 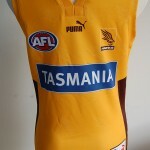 Fans would welcome their inclusion , and enjoy the spectacle , whilst wearing their football jumpers , jerseys , guernseys . 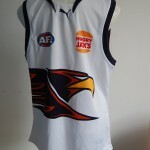 This entry was posted on Thursday, January 12th, 2012 at 7:57 am	and is filed under AFL, football jumpers, NRL. You can follow any responses to this entry through the RSS 2.0 feed. Both comments and pings are currently closed.